After lusting over the Sleek Cleopatra's Kiss palette for many months, it was time to take the plunge. I'm not going to lie, it was the packaging that pulled me in. I haven't seen anything on the high street that has such a luxurious feel to it than this palette. It's easy to see how it would get your attention. It's sleek (well, we know where they got their name from now) and has a luxury feel to it due to the gold packaging and huge mirror tucked away inside. I have a pet peeve with compact beauty products that don't have mirrors inside, but Sleek have the hit the nail on the head with this one. There are two cream shades and two powder shades in this palette and I like that they're trying to cater to everyone's needs, but I'm still favouring the powder consistency right now. However, hopefully, I can give the others some more love in time. 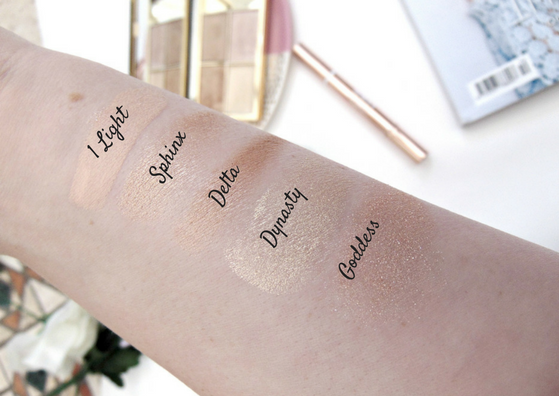 They all have a subtle shimmer to them and they look gorgeous on the skin, you can see in the swatches below. For a short time, I was sure this was a concealer. However after trying it a couple of time, I noticed it was brightening my face. I decided to actually read the product and to my delight, I found out it was highlighter pen. I picked the lightest shade, which is imaginatively called 'Light'. Aside from the name, the packaging is once again gorgeous and I'm more than happy that the high street are stepping up their game when it comes to the look and the feel of products. In a sleek, gold tube, this highlight looks more expensive than it actually is. The application is so easy, I'm such a fan of the pen as you can create precise lines and accurate highlight much easier than a brush. The product is bright and it really creates a perfect highlight. I use this on my cheekbones, under my eyes, on the brow bone, down the nose, cupid bow and chin. It subtly brightens this area up without an over the top shine or shimmer. In terms of longevity, it's been amazing so far and it has done a pretty good job at staying put. I find actually these two highlights work great together and I regularly reach for them both when I've been getting my contour on. I start with the L'Oreal highlight pen to create a strong and smooth base, brightening up areas such as my nose or chin which I don't want a shimmer for. Once the base is set, I then use the Sleek palette to add a shimmering pop of highlight to finish. I couldn't recommend these two highlights enough. Whether you're looking for a shimmering highlight for your cheekbones or a highlight pen to brighten up your features, these two are the perfect products. They're two strong, but affordable products that you'll never want to leave the house without again.